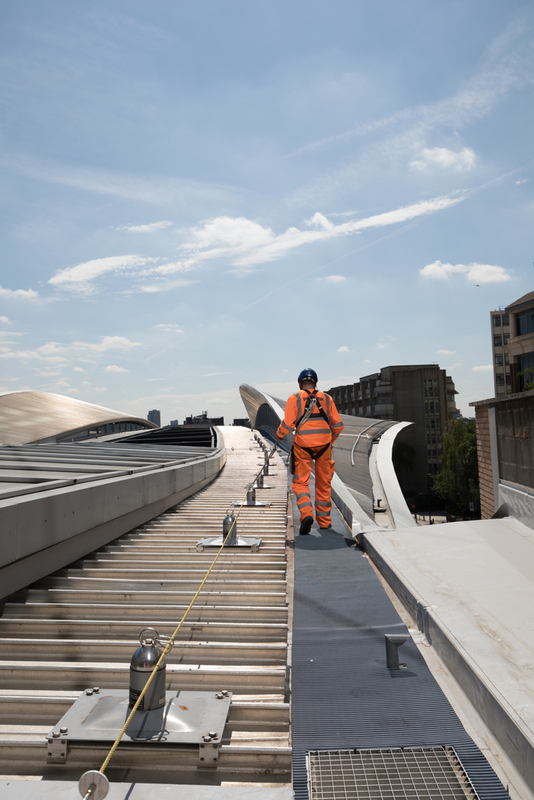 The regeneration of this 180-year-old iconic railway station has involved meeting safety at height requirements for the vast expanse of new roofing. According to James Sainsbury, MSA Safety's fall protection sales leader for the UK and Ireland, this has been a hugely exciting project but also enormously challenging for a variety of reasons. Eurosafe Solutions, registered installer of MSA’s Latchways engineered lifelines, was able to work closely with MSA to provide a high specification fall protection solution. The project took place in phases as part of the Thameslink Programme, with the station remaining open throughout construction. This meant that most of the work had to be carried out in the relatively quiet period between 11pm and 4am - a requirement that necessitated careful logistical planning. 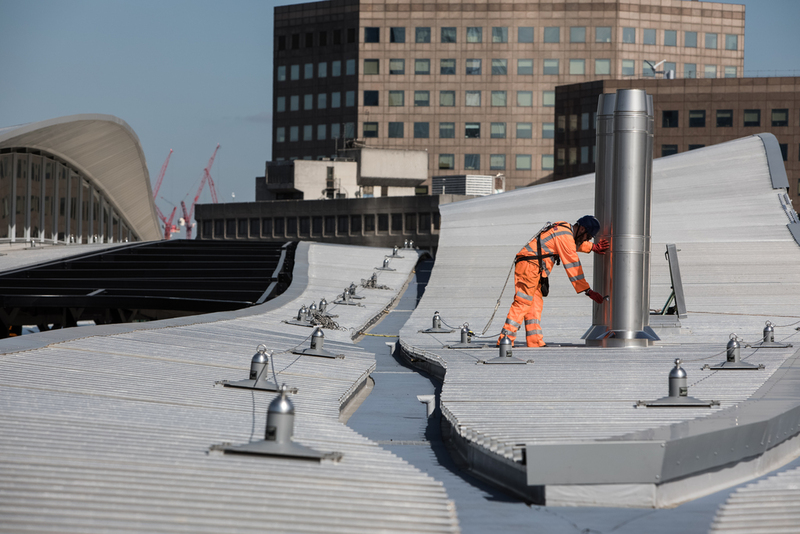 The challenge that was set to Eurosafe was to develop the layout and strategy for a safety at height system that would allow access to the new roof for regular maintenance work. 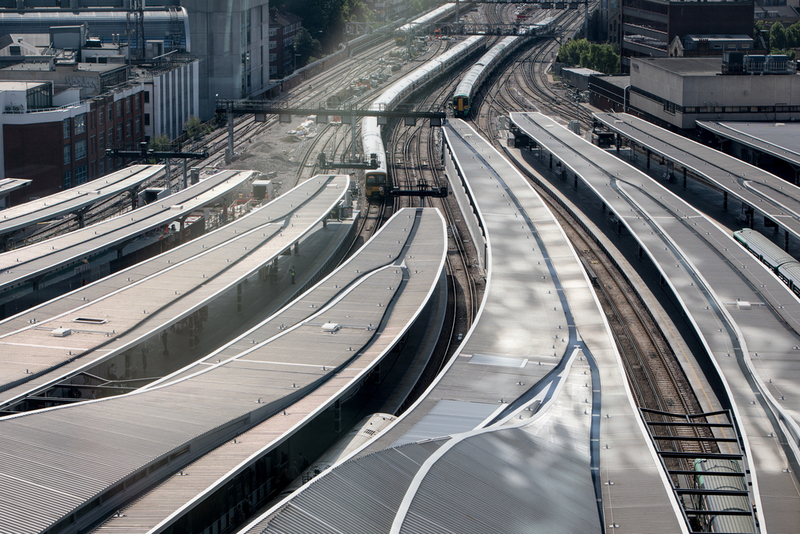 An additional system was needed to access the underside of the roof area so that the structure and essential services such as lighting could also be maintained. The 'wave design' of the new roof and several hard-to-reach areas meant that the safety at height systems had to be completely bespoke. This was a tough brief in its own right and, to add to the challenge, the working environment was also high risk. Workers, including those installing the safety systems, had to carry out their tasks above a live railway line and inside a busy railway station. James explains: “With so many factors at play, the fall protection strategy had to be absolutely sound. We started by discussing the project with the building’s architects and then joined forces with Eurosafe to design a solution that would not only allow their operatives to work safely at height, but would also look aesthetically pleasing in conjunction with the new roof. 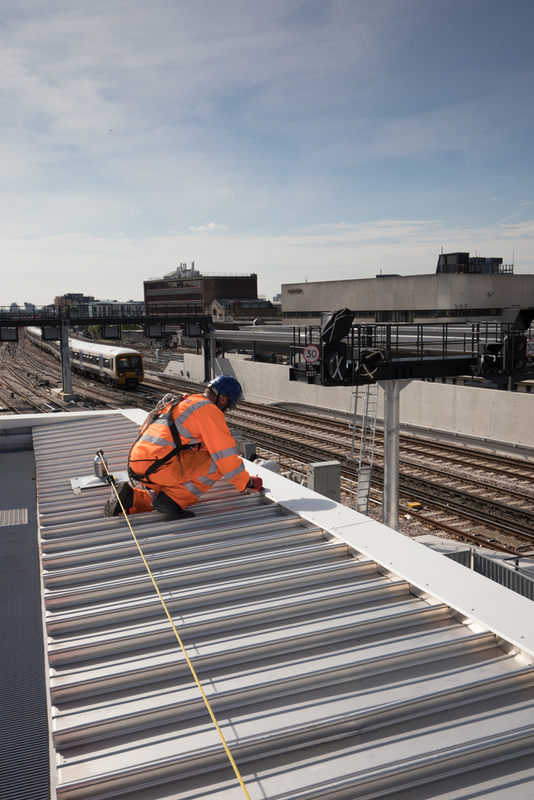 The solution that was chosen to offer complete rooftop fall protection was the MSA Latchways Constant Force Post (CFP) cable system, fitted to a Kalzip standing seam roof sheet. Installation was complicated by the very narrow roofing sections, a consequence of the roof’s wave design. MSA overcame this by working with the roofers to increase the fixing spacings. 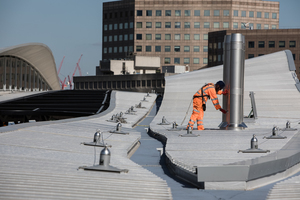 Eurosafe used the CFP solution to create temporary safety systems enabling the roofers to join the cassettes together during the construction phase. These were then made permanent after the roof was completed. An advantage of this approach was that by working off site, the amount of scaffolding needed at the station was reduced, providing a valuable cost saving. 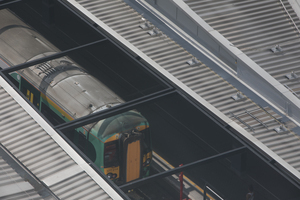 Due to the tapered roof widths, different length lanyards and harnesses had to be used for different areas of the roof. MSA and Eurosafe made it obvious which sections required 1.5m or 2.0 metre components by colour coding the lifeline cables in each area. The team also created one-off components to link the CFP system around London Bridge station with that of the adjoining building, The Shard. To meet the second requirement, creating a safety at height system for access to the underside of the roof, Eurosafe installed over 1000 metres of NP01 monorail under the roof to carry made to measure cradles for maintenance workers. This enables access to all areas of the new concourse where cherry pickers could not be used due to restricted space and voids below. The cradle can be controlled remotely from the concourse for testing and employs a number of one off features such as laser sensors to avoid contact with any part of the structure. James says: “Together with Eurosafe, we've overcome many logistical problems involved with this project. This project has been a huge success - partly due to Network Rail’s insistence on going the extra mile where the safety of its staff is concerned. Through careful planning and implementation, we've been able to achieve a fall protection solution that is aesthetically pleasing and, because of the systems ease of use, offers greater productivity. As well as that, Network Rail has peace of mind that all our solutions are fully compliant with current legislation and test standards."